BOOKSHOPS CAN BE a destination upon themselves. From ones bordering a canal where the books are kept in bathtubs and boats, to a converted 13th century church, check out some of the most interesting book retailers out there. Shakespeare and Company, Paris, France. The original Shakespeare & Company on Paris’ Left Bank was a hangout for Ernest Hemingway, Ezra Pound, and James Joyce, but closed during World War Two. The store re-opened in 1951 and has become a popular favourite because of its ambience and selection. “Time has not sundered the love-in between literature and Paris’s Left Bank,” writes Time. Libreria Acqua Alta, Venice, Italy. This bookshop features classic volumes of American and Italian books packed in traditional Venetian gondola boats. But the show-stopping attraction is the back of the bookshop, which opens up to a beautiful canal. “It’s a bookshop right on the canal that floods every year, so the eccentric, stray-cat-adopting owner keeps his books in boats, bathtubs and a disused gondola to protect them,” writes Paris Review. Livraria Lello & Irmao, Porto, Portugal. “Once inside, there is the curvaceous red stairway connecting the two levels (inspired on the Parisian Galleries Lafayette), the heavily decorated walls and ceilings, and the magnificent stained-glass skylight with Lello’s motto vecus in labore will no doubt impress you,” one visitor writes on bookstoreguide.org. El Ateneo, Buenes Aires, Argentina. This bookshop is housed in an ornate theater building from the 1920′s. Customers can sit in still-intact theater boxes to relax and browse their books. “While the selection of books on offer is standard chain store fare, bibliophiles will find the staggeringly opulent display of books to be reason enough to pay El Ateneo Grand Splendid a visit,” according to Atlas Obscura. The Bookworm is both a lending library and a bookshop with a ridiculously expansive collection. There’s also a gourmet European cafe on the premises. “We love this Beijing spot when we’re craving a double-dose of intellectual stimulation and decent café food. Thousands of English-language books fill the shelves and may be borrowed for a fee or read inside. New books and magazines are also for sale,” writes Fodor’s Travel. Boekhandel Selexyz Dominicanen in Maastricht, Holland. 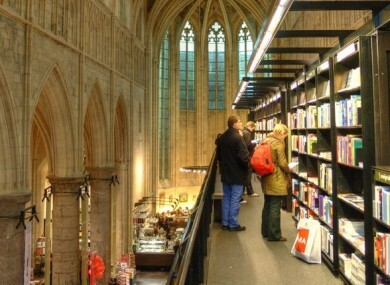 This epic bookshop is a converted Dominican church from the 13th century. The serene alcoves of the church now serve as reading nooks. “A superb example of adaptive re-use, the Selexyz Dominicanen infuses rich and historic architecture with plentiful shelves ripe with information,” writes Diane Pham at inhabitant.com. This East Village retailer boasts 29 kilometres of books. “Its prices and selection are seldom beat, and there’s still the unique thrill of finding a copy of The Grapes of Wrath once belonging to the Rikers Correctional Library in their 49-cent bin,” writes Gothamist. “The sixty-eight-thousand-square-foot space is divided into nine color-coded rooms, which together house more than 3,500 sections,” writes Poets & Writers. The Winding Stair, Dublin city centre. And right here in Ireland, we have this little gem. It’s made up of the winning combination of a beautiful book shop downstairs, and an equally beautiful restaurant upstairs. The whole thing comes together quite nicely in a rickety homely kind of way. What Irish bookshops would you recommend? Tell us in the comments below. Email “Every bookworm must visit these shops at least once”. Feedback on “Every bookworm must visit these shops at least once”.